The treasure-filled exhibit pays respectful remembrance to the First Lady of Song. "Ella at 100: Celebrating the Artistry of Ella Fitzgerald" is on exhibit at the Grammy Museum at LA Live through Sunday, Sept. 10. If you've ever heard the opening swirl of a melody straight from the Great American Songbook, the kind of unmistakable flourish that lets the listener know that a classic composition is on its way, you likely paused, and made a wish, and that wish was this: May I soon, in moments, hear the singular voice of Ella Fitzgerald. For while many accomplished chanteuses and crooners covered some of the most romantic and stirring works of the mid-century, Ms. Fitzgerald was known as the First Lady of Song for excellent reason. She brought a Certain Something to each famous number she sang, a Certain Something full of depth and wit and jazzy joy, elevating a bevy of already sublime ballads as she winningly went. 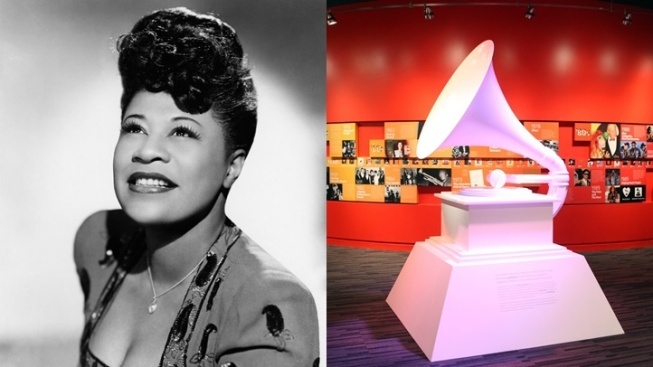 The Grammy Museum is remembering the life of the unparelleled Ella Fitzgerald during this, her centennial year, with a new exhibit called "Ella at 100: Celebrating the Artistry of Ella Fitzgerald." The memorabilia-laden presentation is on display at the LA Live music institution through Sunday, Sept. 10. What can fans of the icon, who won 13 Grammys, expect to see? Her first Grammy Award, an award that "...made her the first African-American Grammy Award-winning artist." "Rare sheet music and recordings" are also available for viewing and listening, as well as her "well-known" beaded gown by Don Loper (other wardrobe pieces are also part of the exhibit). A number of fan-fabulous happenings are flowering during the Ella Fitzgerald Centennial, both inside the museum and beyond. Fresh album releases, featuring many Fitzgeraldian classics like "(I Love You) For Sentimental Reasons" and "I've Got You Under My Skin," debuted on April 21 on a new collection called "100 Songs for a Centennial." Duets with Louis Armstrong and an album of Ms. Fitzgerald's "... classic vocal recordings accompanied by new orchestral arrangements by the London Symphony Orchestra" are also ahead for music mavens. A fine place to start, to make sure you don't miss a thing? Keep up with the Ella Fitzgerald Charitable Foundation to stay up-to-date on releases, tributes, and the glorious goings-on. And, here in Southern California, pay a visit to the fourth floor of the Grammy Museum, before Sept. 10, 2017, to learn more about the First Lady of Song, who passed away in 1996. The icon's many concert clips, her impressive catalog, and her charitable, give-back legacy, continue into the future, where new fans will be made, again and again, joining the lifetime fans of today. So have you ever hoped for a just-starting tune to be an Ella-led one, and, delights of delights, found your hopes answered? The new "Ella at 100" exhibit is that feeling taken museum form, a respect-filled look-back at the top-notch, music-changing career of the First Lady of Song.